Home » Reviews and Publicity » Stars & More for ROSALIE LIGHTNING! Stars & More for ROSALIE LIGHTNING! ROSALIE LIGHTNING is Eisner-nominated cartoonist Tom Hart’s beautiful and touching graphic memoir about the untimely death of his young daughter, Rosalie. Using the graphic form to articulate his and his wife’s on-going search for meaning in the aftermath of Rosalie’s death, Hart explores themes of grief, hopelessness, rebirth, and eventually finding hope again. Watch the amazing book trailer. 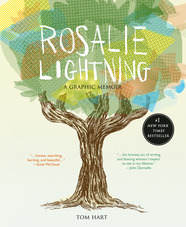 ROSALIE LIGHTNING will be available from St. Martin’s Press on January 12, 2016.